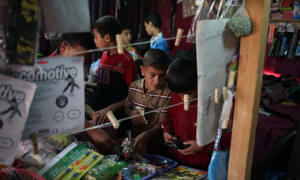 Home > Global > Syria records its millionth child refugee. UNICEF says the global community has failed in its responsibility to the children displaced by the violence in Syria. Syria records its millionth child refugee. UNICEF says the global community has failed in its responsibility to the children displaced by the violence in Syria. The Syria crisis reached another grim milestone as UN aid agencies reported that the number of registered child refugees had reached 1 million, most of whom were under 11. Within the country, more than 2 million children have been displaced, they said.